(SPOT.ph) Another payday is coming up! Where are you planning to treat yourself? We've got a few ideas: Unlimited steak and chicken wings, two-for-one salad, free pasta, and more. 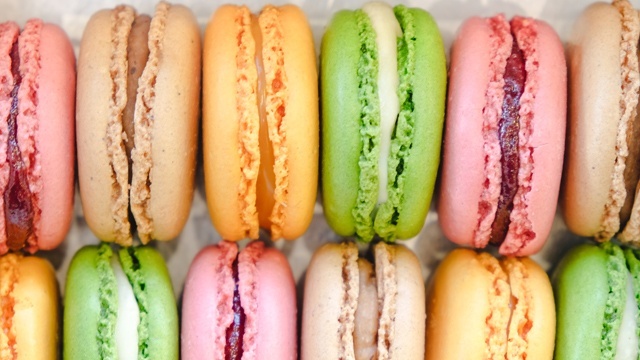 Race you to these food stops! Looking for something to keep you pumped throughout the weekend? 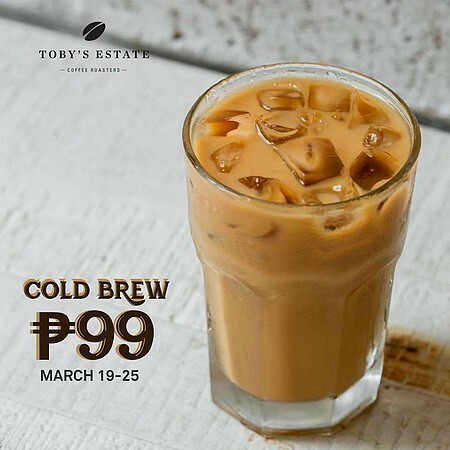 Get caffeinated and enjoy a creamy, milk-chocolate flavor with hints of toffee with Toby’s Estate’s Cold Brew White! It’s only at P99 until tomorrow. Regular Cold Brew is also available at the promo price. 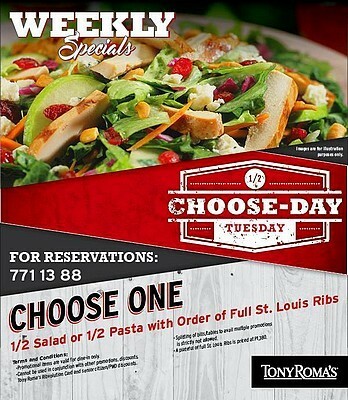 It’s Choose-Day Tuesday at Tony Roma’s. Order a Full St. Louis Ribs and sample either a half-salad or half-pasta for free! This promo is valid for dine-in transactions every Tuesday only. Tony Roma’s is at 2/F Expansion Wing, Ayala Alabang Town Center, Muntinlupa City. For more information, log on to Tony Roma's Facebook page. Give in to the need to chill this summer with Wendy’s! 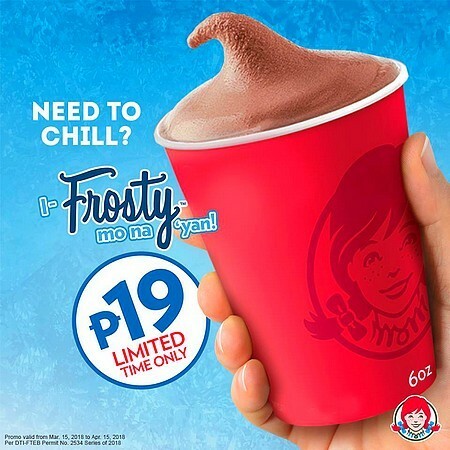 Get your daily dose of Frosty for just P19. Hurry, this huge steal is available until April 15 only. See a list of Wendy’s branches. For more information, log on to Wendy's Facebook page. Alabang Town Center is at Alabang-Zapote Road corner Madrigal and Commerce Avenues, Alabang, Muntinlupa City. For more information, log on to Alabang Town Center's Facebook page. March Madness is in full swing at Flaming Wings! 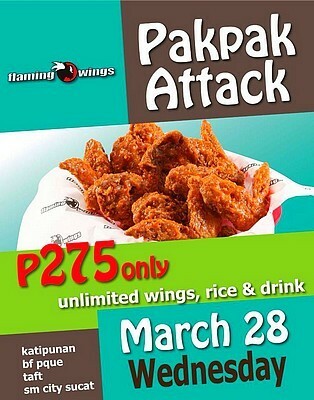 Enjoy all-you-can-eat wings, rice, and drink for just P275. 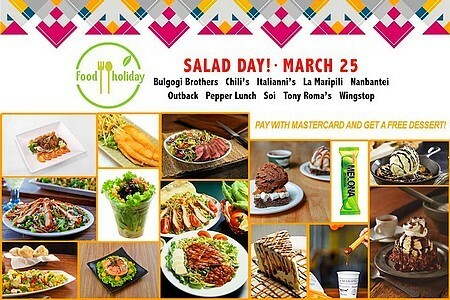 Take note: This promo will be on March 28 only, so save the date! 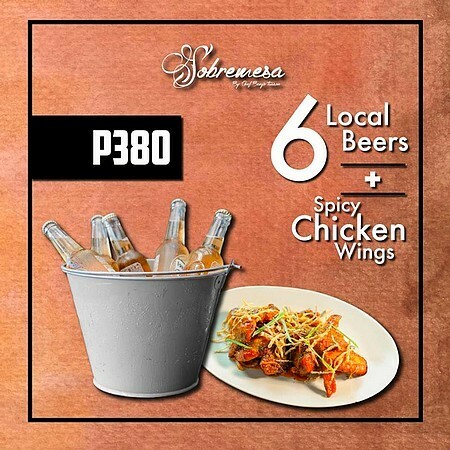 Sobremesa knows that all you need this weekend are six bottles of beer with the gang. That's why they’re making things better by giving you free spicy chicken wings to go with your bucket of local beer—all for just P380. Sounds awesome? Then drop by tonight and enjoy! Sobremesa is at The Sapphire Bloc, Sapphire Road, Ortigas, Pasig City. For more information, log on to Sobremesa's Facebook page. Enjoy Subway goodness without the guilt! 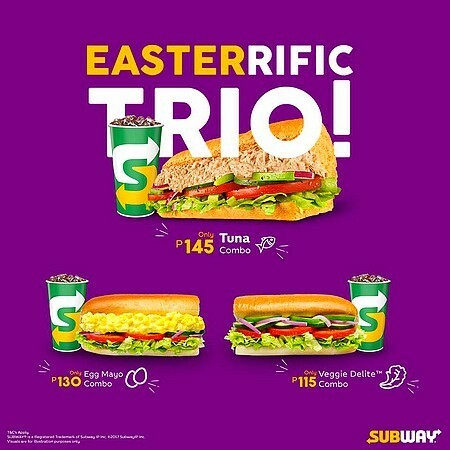 Choose from their Tuna, Egg Mayo, or Veggie Delite combo deals. 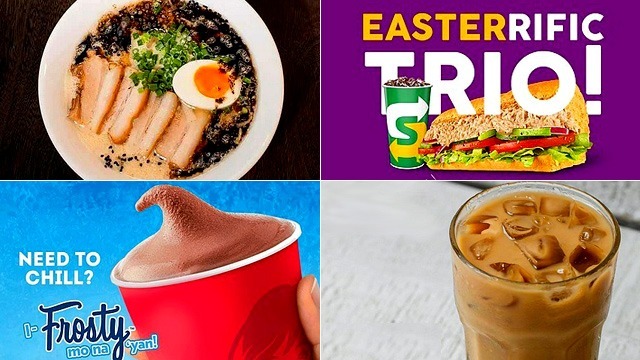 Get a six-inch Tuna sub with drinks for P145, the six-inch Egg Mayo sub with drinks for P130, or a six-inch Veggie Delite with drinks for P115. This promo is valid for dine-in and takeout transactions until May 16. 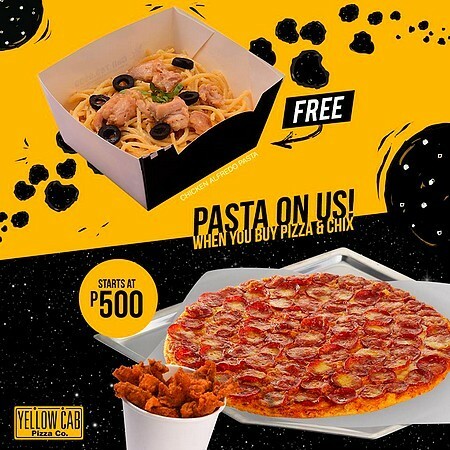 Fuel your hustle with free pasta from Yellow Cab! Get one free Regular Chicken Alfredo when you buy a 10-inch Regular Pizza of any flavor) and one Regular Chicken of any flavor. This promo is valid for dine-in, takeout, and deliveries until March 31. 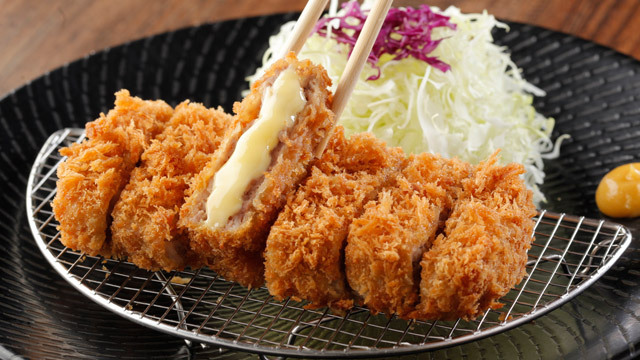 Experience real Japanese and have bowl of ramen! Head over to Ramen Kuroda and celebrate the second anniversary of its Venice McKinley branch! Enjoy unlimited noodles for free when you order any Ramen, Chashumen, or any Set Meal. This promo will run until tomorrow only. 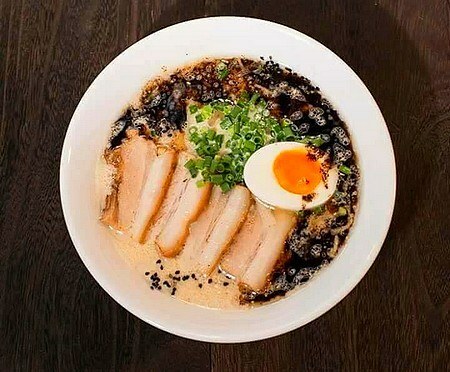 Ramen Kuroda is at 2/F Venice Grand Canal Mall, Upper McKinley, Taguig City. For more information, log on to Ramen Kuroda's Facebook page. Looking to load up on your proteins? 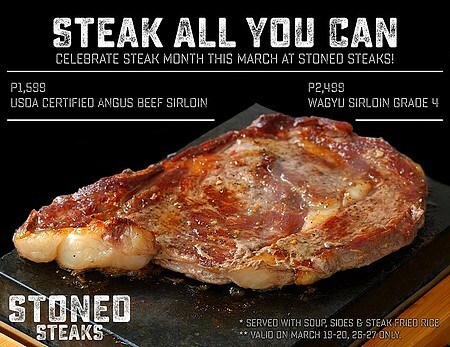 Do it at Stoned Steaks and dig into all the steak that you can eat. For P1,599, enjoy unlimited USDA Certified Angus Beef Sirloin or the Wagyu Sirloin Grade 4 for P2,499. Each order comes with soup, sides, and fried rice. This promo will be running on March 26 and 27.